SPARTA, KY. (June 14, 2008) -- Everybody knew Joey Logano would win in the NASCAR Nationwide Series. It was just a matter of how quickly he could get it done. 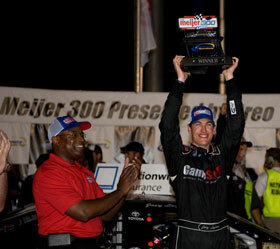 In only his third career start, Logano answered that question Saturday night in the Meijer 300 at Kentucky Speedway, becoming the youngest driver to win in NASCAR Nationwide Series history at 18 years and 21 days. "It's definitely awesome," Logano said. "We didn't unload this morning the way we wanted to. (Crew chief) Dave (Rogers) and the guys never gave up. They worked hard on it and changed everything. That last pit stop we got it about right. Overall, it was a pretty good night." Kentucky has now produced three straight first-time winners and eight different race winners in as many races. Logano won the pole for the 300-miler, his second in as many weeks, and led 76 of the 200 laps, second only to Joe Gibbs Racing teammate Kyle Busch. Busch led a race-high 85 laps. Logano took the lead from Busch on Lap 147, passing him on the outside of Turn 4. On Lap 164, Busch's charge to reclaim the position ended after he lost control of his Toyota on the backstretch, spinning and slamming the outside retaining wall. Busch started the event 43rd after flying into Kentucky following the NASCAR Craftsman Truck Series race in Michigan. He slid into the lead for the first time on Lap 40. Following Busch's wreck, the race was Logano's to lose. With the race running green flag to the finish thereafter, Logano crossed the finish line 2.259 seconds over second place Scott Wimmer. "It was unfortunate to see Kyle hit the fence there," Logano said. "The whole last 20 laps I was praying it would go green." The win was the 10th overall on the season for Joe Gibbs Racing and the seventh for the No. 20 team, with four different drivers, led by Rogers. "When you are in good equipment, you are going to run well," Wimmer said. "Joey is a great driver. The 20 car has been the class of the Nationwide Series all year long. We need to do our homework." "Three starts, two poles, one win. He's okay," Rogers said of young Logano with a smile. Mike Wallace picked up a position to finish third at the finish after Jason Leffler lost a tire on the last lap. Leffler finished 16th. Nashville winner Brad Keselowski and rookie Bryan Clauson finished fourth and fifth. Clauson who turns 19 on Sunday, notched his career-best finish. Keselowski is now second in the point standings behind leader Clint Bowyer. Marcos Ambrose, David Ragan, Mike Bliss, Bowyer and Jason Keller rounded out the top 10. Race attendance was a track-record 73,195. It was the eighth straight sellout at the facility in which Speedway Motorsports Inc. agreed to purchase earlier this year. Joey Logano hoists teh winnter's trophy at Kentucky Speedway as Tony Jones, Cincinnati Market Director for Meijer, looks on. Logano was the eighth different winner and eighth different pole winner at Kentucky; he was also the thrid consecutive series regular to win at the track.